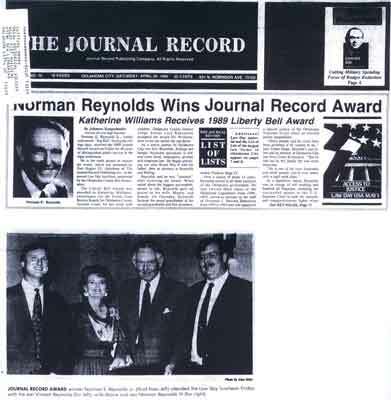 Norman E Reynolds Jr, fondly nicknamed "Big Red" during his college days, received the 1989 Journal Record Award on Friday for 40 years of distinguished public service in the legal profession. He is the ninth person to receive the award, which was presented by Dan Hogan III, chairman of The Journal Record Publishing Co, at the annual Law Day luncheon, sponsored by the Oklahoma County Bar Association. As a senior partner of Oklahoma City law firm Reynolds, Ridings and Hargis, Reynolds specializes in federal court fraud, bankruptcy, probate and corporate law. He began practicing law after World War II with his father, then an attorney at Reynolds and Riding. Reynolds said he was "shocked" after receiving the award. When asked about his biggest accomplishments in life, Reynolds gave all praise to his wife, Maxey, and family. On Thursday, Reynolds became the proud grandfather of his second grandchild and first grandson, Arthur Franklin Hoge IV. Over a course of about 15 years, Reynolds served in all three branches of the Oklahoma government. He was elected three times to the Oklahoma Legislature from 1949 - 1955, served as attorney on the staff of Governor J Howard Edmonson from 1959 to 1963 and was appointed a special justice of the Oklahoma Supreme Court when an elected justice disqualified. "Many people said he could have been governor if he wanted to be," said Arthur Hoge, Reynold's son-in-law and an attorney at Oklahoma City law firm Crowe and Dunlevy. "But he told me he felt family life was more important." "He is one of the most honorable and kind people you'd ever know with a hard work ethic." As a legislative liason, Reynolds was in charge of bill drafting and handled all litigation, including the successful appeals to the US Supreme Court in both the turnpike and reapportionment fights when Oklahoma revamped its legislative districts. In the Legislature, he was a principal author of the bills which led to the construction of the Will Rogers and HE Bailey Turnpikes. He also authored legislation that authorized the creation of authorities to provide fire protection and public water supplies to the unincorporated areas of counties. Friends and family describe Reynolds, who stands about six feet seven inches tall, as a gentleman and natural leader. As a dedicated father Reynolds provided a positive role model for his two sons and two daughters. "If he asked us to do something he always told us why," said his son, Norman E Reynolds III. "He was never hypocritical. We learned through example and explanation." "Whenever possible Reynolds included his family in out of town trips. "We used to make family car trips if Dad was trying a case out of town," said Margaret Hoge, Reynolds' daughter. "Dad always loved practicing law." Since childhood, Reynolds has been a member of the Episcopal Church. He has been elected as Junior and Senior Warden and Vestryman and as a delegate has attended 25 state Dioceasan conventions. He also serves as president of the Episcopal Retirement Community Inc, which is developing the Canterbury Living Center, a retirement community developed and brought to fruition by Reynolds. Concerned about the quality of his children's education, Reynolds founded and became president of private school system Heritage Hall Schools, 1401 NW 115th Str. "The idea for Heritage Hall was formulated in our living room," said Reynolds III. "Dad always impressed upon us that we should get the best education we could - anything else can be stolen, but education can not." Norman Reynolds married Margaret Maxey Cooper, the daughter of respected Oklahoma City doctor, in 1953. They have raised four children, Norman, Margaret, Elizabeth and Robert. While in high school, Reynolds developed a close friendship with John Spradling, now a partner in Oklahoma City law firm Spradling, Alpern, Friot and Gum. Reynolds and Spradling traveled throughout Oklahoma debating the public ownership of power supply and other topics at debate tournaments. Their team placed second in Edmond, Spradling said. During Reynolds junior and senior year at the University of Oklahoma, he and Spradling joined the University's Reserve Officers Training Corps program and both were raised to cadet colonel, the highest possible rank. As a ranking member of Phi Beta Kappa, he earned his undergraduate degree in 1941 and his law degree in 1947. He also received the Gold Leitseizer medal for outstanding male student, was a member of Phi Delta Phi legal fraternity and twice president of Sigma Alpha Epsilon social fraternity. World War II interrupted Reynolds studies during his first year of law school in 1942. With the threat of war at hand, both Reynolds and Spradling were admitted to the bar before they finished law school. "They were being kind and thought we would get killed," Spradling said. After preparation at Fort Sill, Reynolds and Spradling were both assigned to 31st infantry division. "We were never more than two hours travel apart during our time in the United States, New Guinea, Morotai, the Phillipines and Japan," Spradling said. Making the best of hard times, the two supplemented their income by winning bridge games. They had learned bridge in high school while waiting their turn in debates. Reynolds attained the rank of captain in field artillery during his service in New Guinea, the East Indies and the Phillipines. During the Japanese occupation on the island of Shikoku, Reynolds became an information and education officer and received a commendation medal for the establishment and operation of a division school program and newspaper. Among his many accomplishments, Reynolds was elected national Secretary of Commercial Law League of America, awarded the President's Cup by the Commercial Law Litigation Association in 1980 for outstanding work in commercial law and appointed 1978-79 American Bar Association Chariman of the National Conference of Lawyers and Collection Agencies. Today, Reynolds loves to play golf in his leisure. "He's the only person with a 43-piece golf swing," Spradling said. "When he swings his club I have accused him of making an arc as big as Noah's." picture caption: Journal Record Award winner Norman E Reynolds Jr (third from left) attended the Law Day luncheon Friday with his son Vincent Reynolds (far left), wife Maxie and son Norman Reynolds III (far right).